Area:Land 237 km². Freshwater 0 km². Exclusive Economic Zone 1,830,0000 km². Terrain: Low coral atolls in north; volcanic hilly islands in the south. Climate: Cook Islands has a tropical climate moderated by tradewinds. Geography: The northern Cook Islands are seven low-lying, sparsely populated, coral atolls; the southern Cook Islands consist of eight elevated, fertile, volcanic isles where most of the people live. Economy: Tourism, black pearl culture, fishing and fruit processing are important industries. Copra, papayas, fresh and canned citrus fruit, coffee, fish, pearls and pearl shells and clothing are the main exports. In 1971, the Oceanic Institute of Hawaii submitted a proposal to develop a total atoll production system (TAPS). The culture of mullet, oyster, prawn and ature (scad) was part of the project. The project was initiated but was not successful. A turtle farming system was initiated by the SPC in 1974. The site, located in Aitutaki successfully hatched green turtle eggs. However, it had feed problems when the turtles became carnivorous. Starvation and high disease incidence occurred and the project was terminated as unfeasible. Silver-lipped pearl oysters (Pinctada maxima) were introduced for culture in 1905 but soon afterwards a cyclone hit and the venture was discontinued. 5 species of giant clams have been reared at the hatchery T.maxima and T.squamosa (native), T.gigas (largest and fastest growing) H.hippopus (a hardy intertidal species) (both species introduced from Australia), T.derasa (spawned from broodstock introduced as juveniles from Palau). Historically the oysters (Pinctada margaritifera) were harvested for their mother of pearl shell, however since the 1986 the First pearl farms were established in Manihiki and in the early 1990 pearl farms and a hatchery were established on the island of Penrhyn. In the late 90 the neighbouring island, Rakahanga established community farm. - Lack of pearl seeding trainers. - Lack of Cook Islanders wishing to undertake pearl seeding training. - Extreme environmental events (warming) and poor pearl farm management practices have caused pearl oysters to become diseased and stressed. The largest aquaculture industry in Cook Islands is black pearl culture. This industry accounts for more than 90% of the value of national exports. 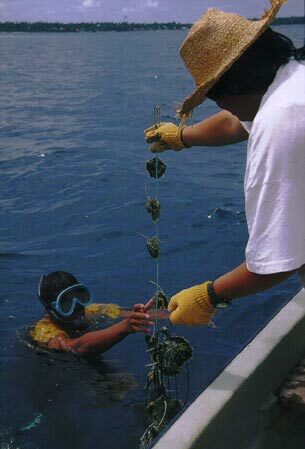 Almost all culture pearls are produced in Manihiki Atoll. Pearls are farmed are Penrhyn (Tongareva) Atoll and Rakahanga Atoll. Hatchery production of giant clams has been ongoing since the early 1990s. However high predation rates by snails and labour intensive culture systems have discouraged farming. There is interest in production for the aquarium market. Macrobrachium shrimp were introduced in the mid 1990s. Trials indicate that good growth rates were achieved but the costs of feed and labour were uneconomical. 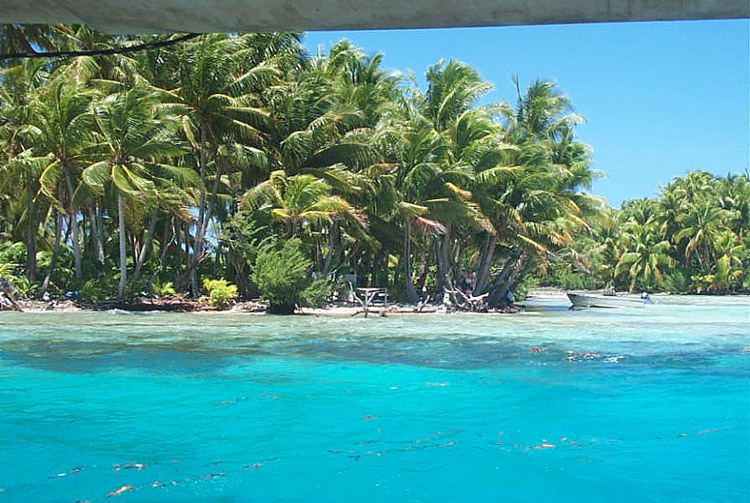 Cook Islands lacks significant fresh and brackish water for production. Further trials are planned. Eucheuma seaweed was introduced in 1986 and 2001. The first trial was destroyed by a cyclone. The second trial showed good growth rates but high levels of predation. Low profit margins may be a disincentive to farmers. Trochus were introduced in 1956. The average annual harvest over the past 10 years has been 16 mt. Trials of hatchery reared trochus for restocking were carried out but the cost of rearing juveniles in the nursery phase was high. Better management of the existing wild stock is the preferred option to maintaining the industry.